Women who have the ability to emulate G-d by bringing children into the world and wear multiple hats on any given day are truly unique and beyond measure. Women have so many responsibilities, they emulate G-d more than men in this regard, and are not counted; they are one and unique and truly beyond the limitations of numbers. Recently I ran across a very troubling one-sided video that shared Rabbinic quotes about women, negative quotes that were often taken out of context. As presented, there was an implication that these negative teachings were standard in Judaism and shared by the majority of Rabbis. What the creators of the video failed to convey is that there are various and diverse views and midrashim on the perception of women – some good, some bad. Unlike any Christian commentary I’ve read, the Talmud is extremely varigated and includes numerous views on every issue imaginable. In typical Hebraic thinking, it does not always present a cut-and-dried, ‘politically correct’ and acceptable-to-all view. The Talmud presents all sides of any particular subject or argument. It is expected that the reader will question and examine the issue at hand him/herself. Though this review on Rabbi Raskin’s book in no way ignores the religious chauvinism and discrimination against women that exists in many societies today, we are honest enough to understand that this discrimination is held by some leaders and members among all faiths. This review is being shared with the hopes of balancing out the scales and welcoming honest discussion. Seeing that he had attracted the minister’s curiosity, he continued. “A woman carries a child for nine months, has labor and birthing pains, then the responsibility of raising children in addition to running her household. This requires a great amount of strength, endurance and patience, things most men lack. So we thank G-d for not giving us the responsibility of a woman. The Rebbe often quoted the Talmud (Tractate Sotah 11B), which states that it was in the merit of the righteous women that our forefathers were redeemed from Egypt. He took this quote to the next level to say that it would be the righteous women who would usher in the coming of Moshiach. The Rebbe would often quote Proverbs 31:10, “A woman of valor is the crown of her husband.” The Rebbe understood that this did not mean that a wife is an accessory or adornment of her husband, but rather, with the advent of our ultimate redemption, the role of women will ‘crown’ and truly topple and outshine the role of men. Every word of Rabbi Raskin’s in Thank You God For Making Me A Woman, is based upon the absolute premise that according to Torah, men and women have always been equal and often in Judaic understanding there are areas where women are held superior. Rabbi Raskin points out that many of the laws concerning prayer, and particularly from the daily Amidah prayer, are derived from the prayer of Chana (Hannah). In addition, that in traditional Judaism a woman’s testimony carries more weight than two men; that women have been endowed with the sacred ability to reveal the G-dliness that is concealed here in the world, and to reveal the potential of all human kind, and that women are born with a greater binah (understanding, intelligence and intuition) than men. Over and over again Rabbi Raskin touches on the fact that in Judaism women are considered not only equal to men but are often endowed with greater spiritual qualities. Written with the highest respect and great sensitivity, Rabbi Raskin wraps up each chapter with a heartwarming story that illustrates the spirit of what was shared in the preceding pages. Every human being has as specific role and design that contributes to the grand picture of creation. 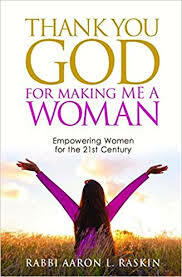 As it should be with any excellent book, Thank You God For Making Me A Woman lends itself to honest dialogue and open discussion, never belittling, insulting, or diminishing any person. If you are interested in the layers of meaning behind the birkhot ha-shahar (morning blessings); the job given to women of lighting the Shabbat candles; baking the challah; the mikvah… Rabbi Raskin writes in a way that is not only simple to understand but very engaging! Very interesting read and does “balance out the scales” somewhat on this issue. When I first saw these two prayers it perplexed me, but listening to Rabbi Raskin has helped to understand….always an amazing explanation that continually blows me away. This now can make sense “We, however, have it easy. G-d gave us 613 laws that tell us exactly what to do. A gentile was only given seven laws, and he has to figure out the rest on his own. We thank G-d for making our job easier.”…… Brilliant explanation!!! Thanks for sharing this Cindy & Keren! !